Situated near the famous Casino de Monte Carlo and Café de Paris the store peers out to the Mediterranean Sea. 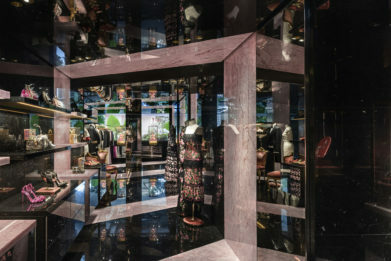 The 700 square meter store is divided over 3-levels to create a vertical procession of three overlapping and distinctive spatial experiences. 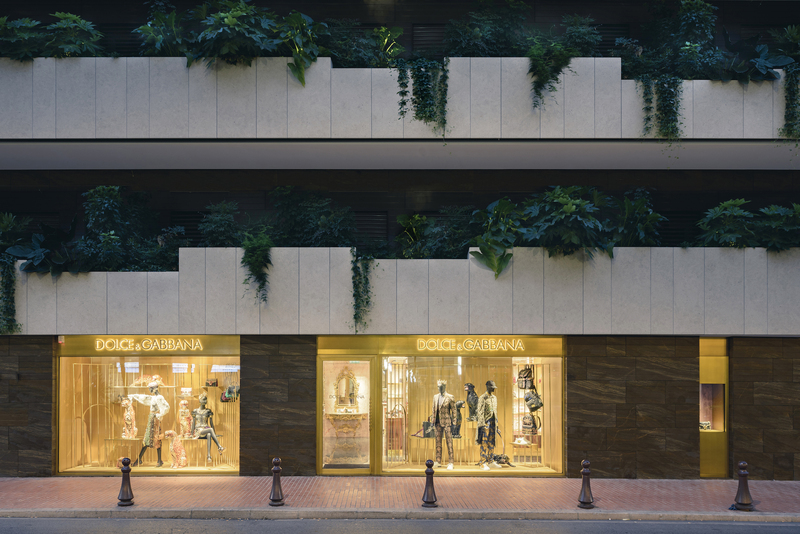 The first of two entries is located on the upper level off of the Boulevard des Moulin. This rectangular space is conceived as an over-sized architectural wardrobe displaying an irresistible visual cocktail of bags, shoes and accessories. 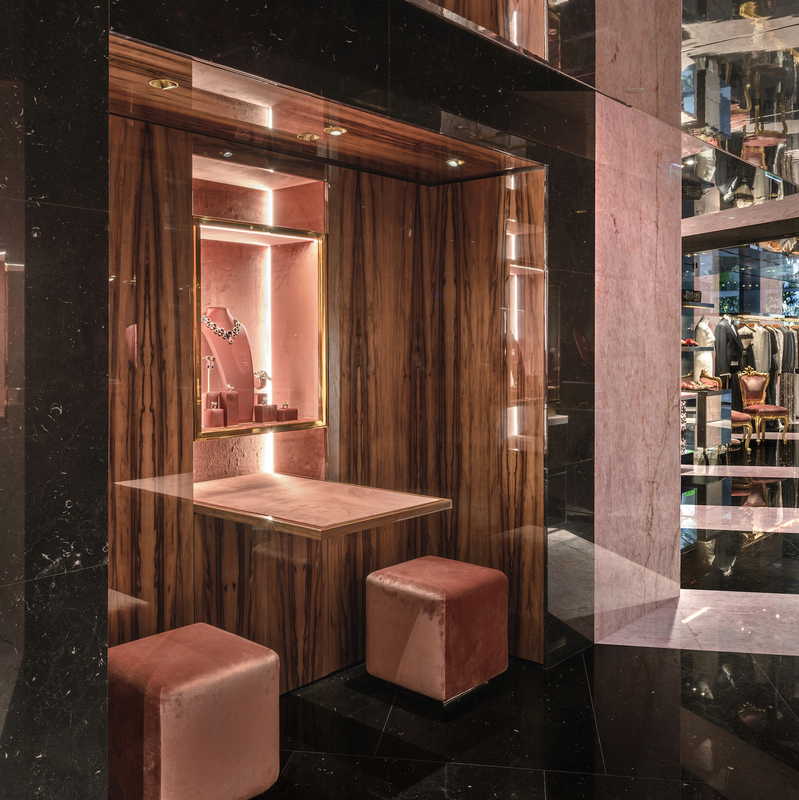 Inspired by the photography of Helmut Newton the space blends the contrasts of sharp orthogonal geometries lined with black nero marquina marble with the crisp facets of an entirely mirrored ceiling and rhythmically mirrored walls. 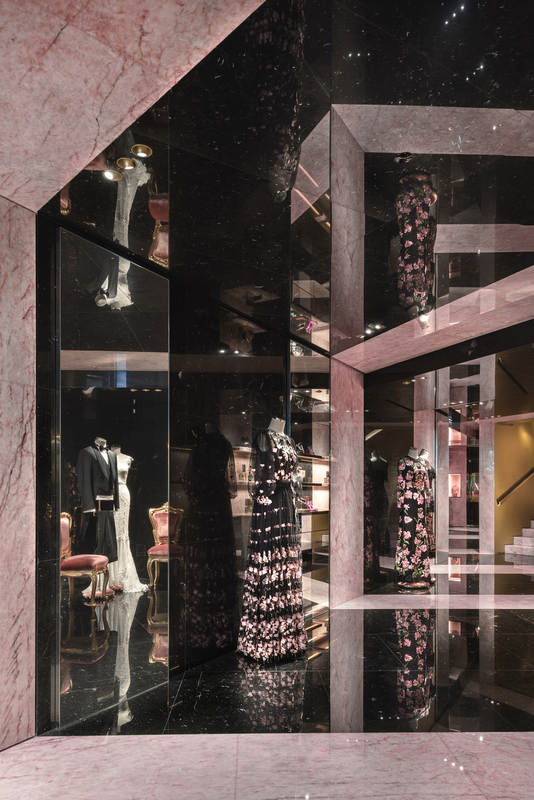 Together the combination of sharp and burry architectural surfaces creates an intangible and magical impression as if stepping inside a jewel. 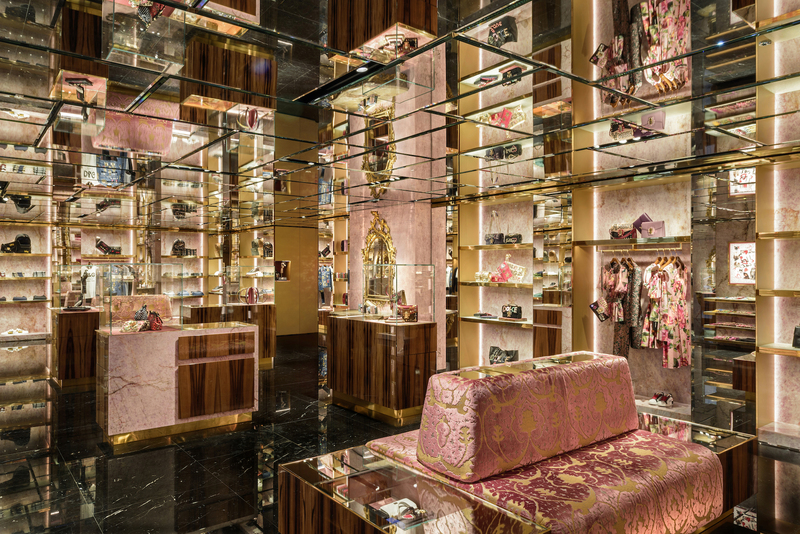 From lower level, a second discreet VIP private entry is accessed from the Avenue de la Madone. 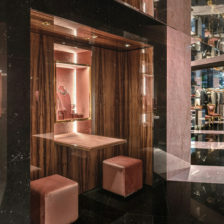 Upon entering, a long narrow space architecturally interprets the famous swirling “007 gun-barrel” with dramatic alternating spirals of black marble and pink quarzo rosa stone lining the floor, walls and ceiling. 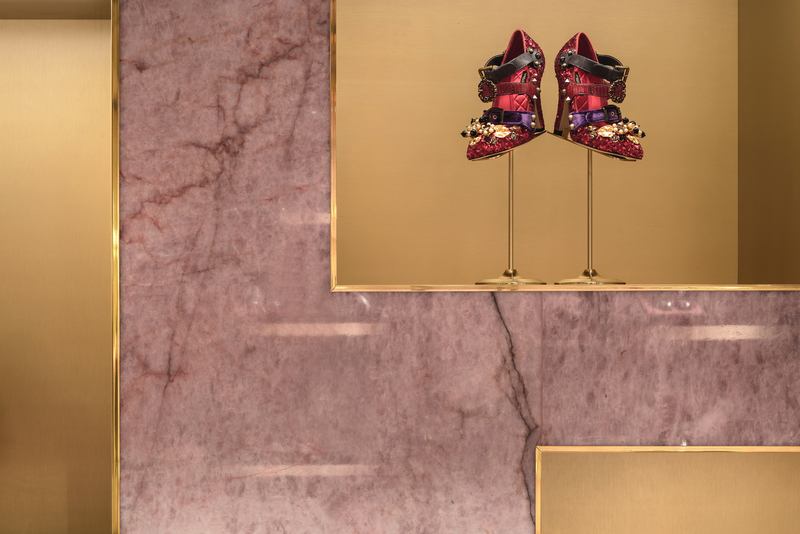 The elegant and dynamic volume intimately displays the women’s Serra clothing, shoes and accessories. 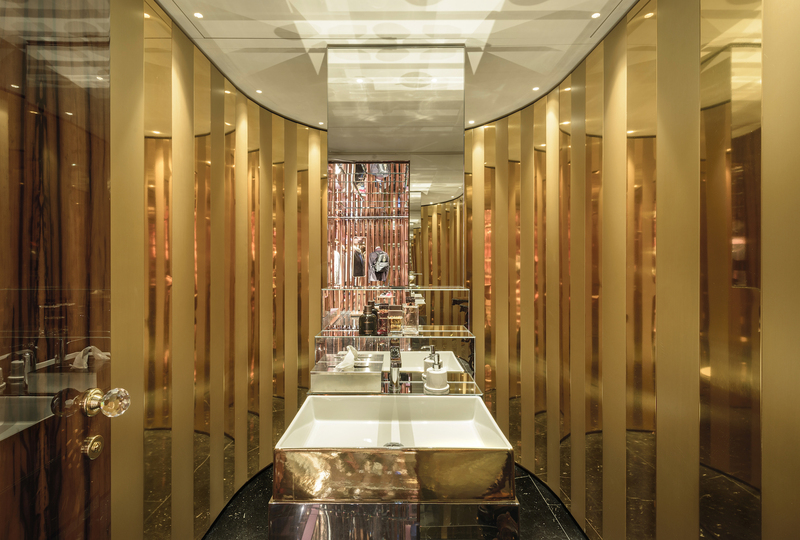 Located between the upper and lower levels is the spacious central floor, a large horizontal volume designed to gleam and glimmer. 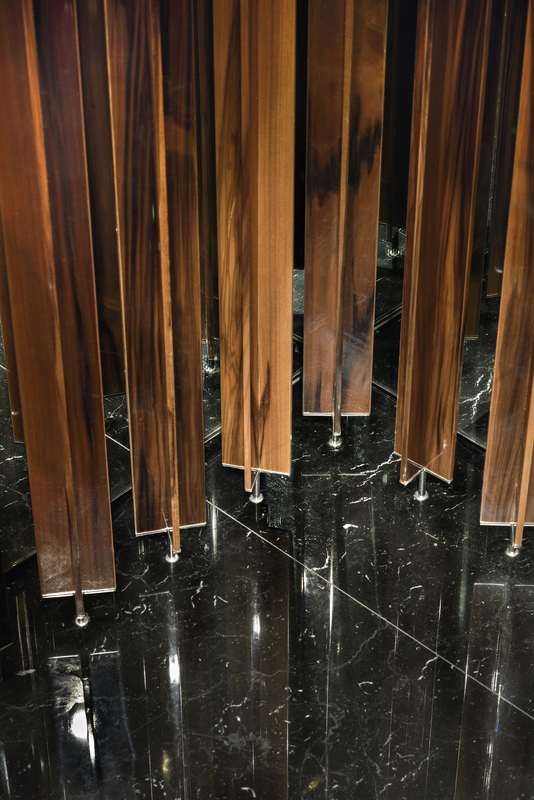 The ceiling is completely sheathed with sparkling panes of beveled mirror and the floor finished in black polished marble. The perimeter walls with 180° of views and natural light are filtered by a layer of shimmering vertical bars of brushed and polished brass for the women’s areas and lacquer varnished smoked redgum wood for the men’s area. 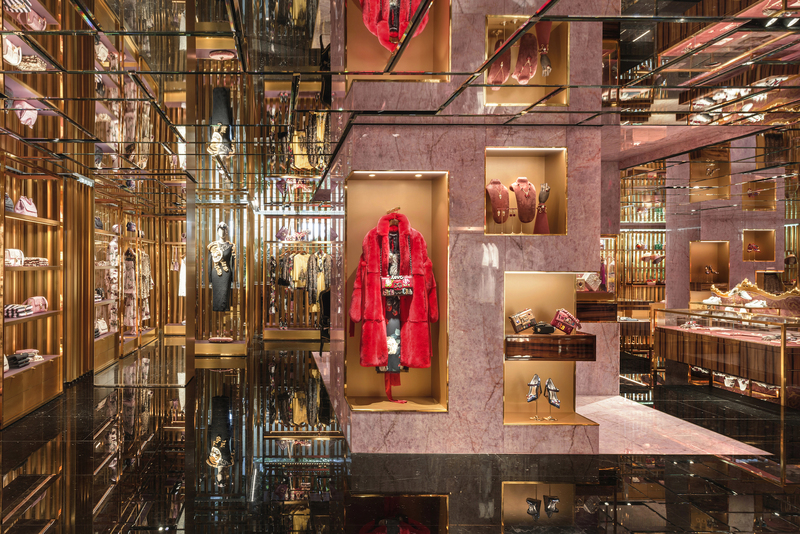 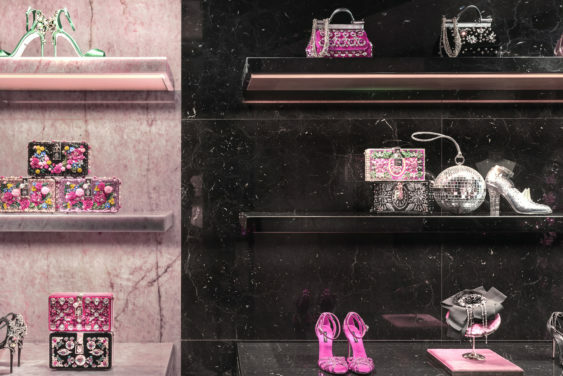 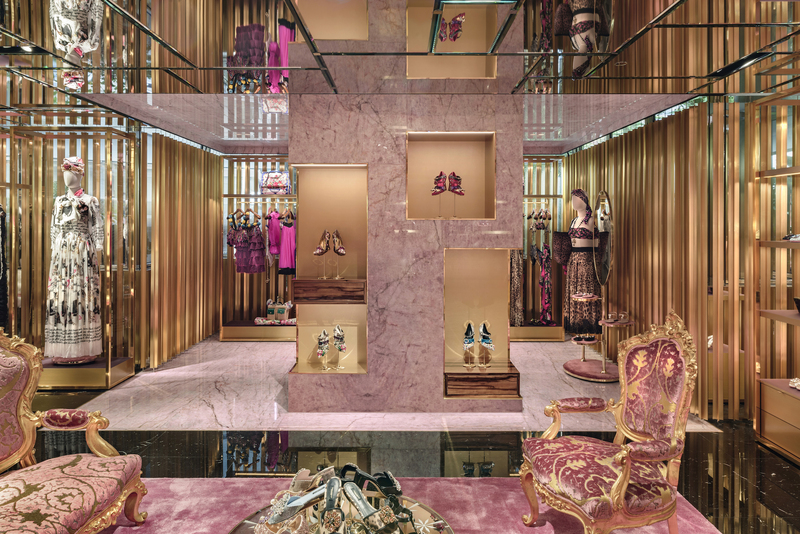 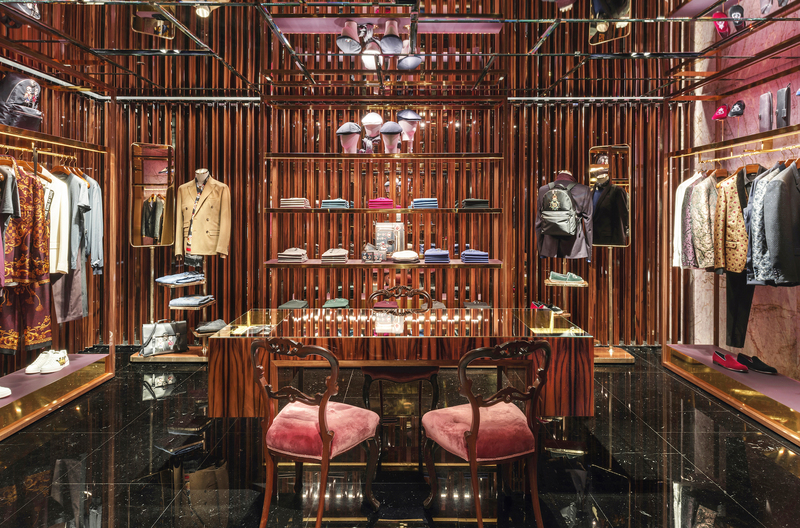 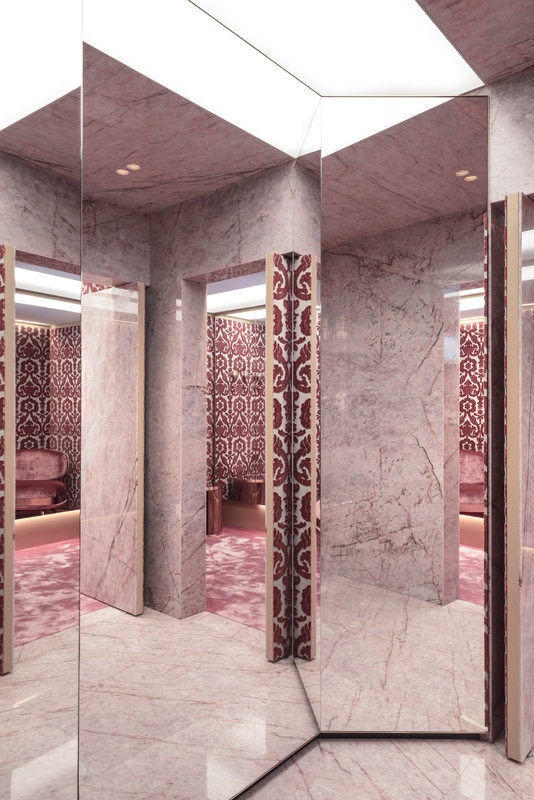 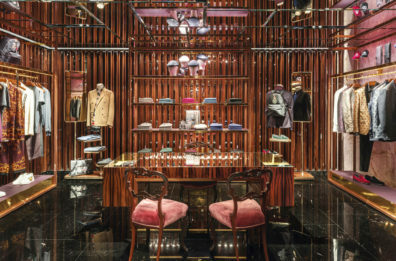 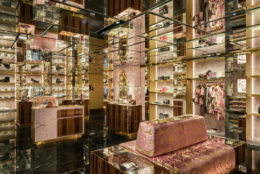 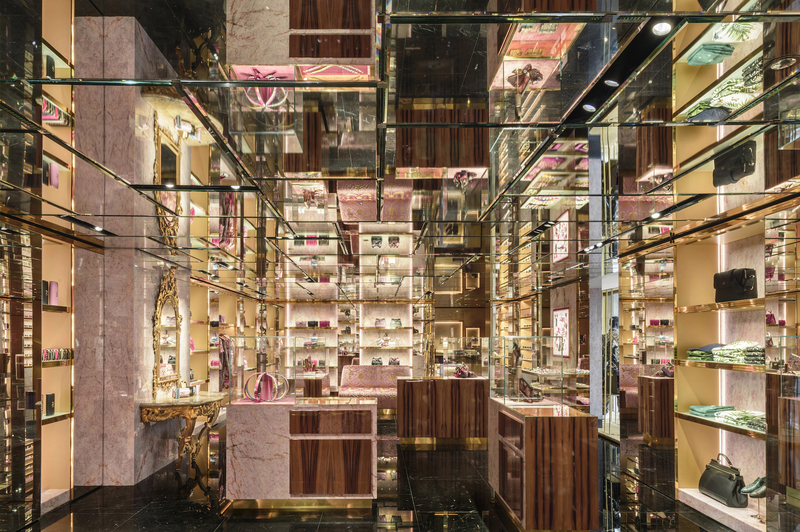 Punctuating the sumptuous orchestra of luminous effervescent surfaces are 4 opulent floor-to-ceiling islands crafted in pink Quarzo rosa stone and randomly positioned to create intimate zones for fine jewelry, women’s beachwear, the changing rooms and staircase.